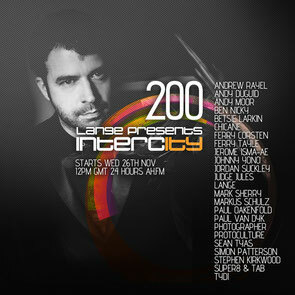 After the success of previous years, Intercity is back with another 24 hour broadcast to mark the 200th episode and arguably one of the biggest lineups to date. 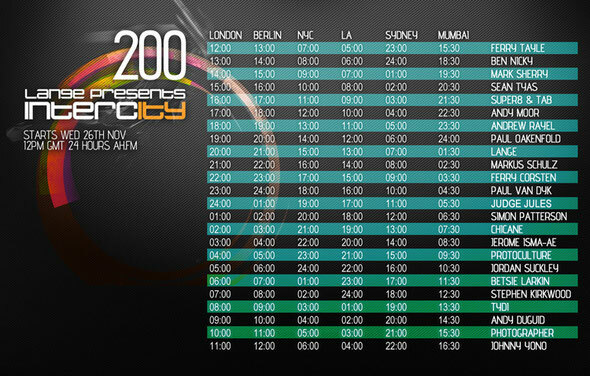 To experience the show, clubbers are encouraged to tune in to ah.fm from midday GMT on Wednesday 26 November and join in on Twitter using #Intercity200 or follow @djlange. The lineup includes many big artists of dance music alongside some new comers who are starting to make waves. Previous years have been a big online success with last year's 150th show apparently becoming a #1 worldwide Twitter trend for over 10 consecutive hours, #1 USA trend and the 7th biggest trend in the USA on broadcast day for the 24-hour long episode! Can this year do better? As ever Lange will be present for the full 24-hour broadcast to chat to fans live across the globe and challenges everyone else to join him.